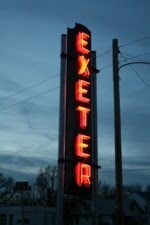 Over half of the Exeter-Milligan Class of 2011 came to the Exeter Alumni Banquet. They are picture in the back row from the left, Jameson Trauger, Landon Rhodes, Cody Soukup, Jake Wilkins, Amanda Dinneen, Zach Jensen and Andrew Colson. Front row from the left are Mariah Ruhl, Tyler Manning, MiKayla Ruhl, Caroline Harre, Cassie Harre, Mikayla Bigeolw and Kelsey Moore. 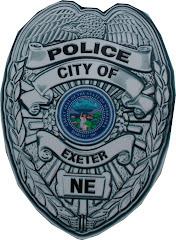 The Exeter Alumni Association hosted their Annual Alumni Banquet Saturday with over ten classes represented. The class of 2001 planned and hosted the event and were seated at the head table. 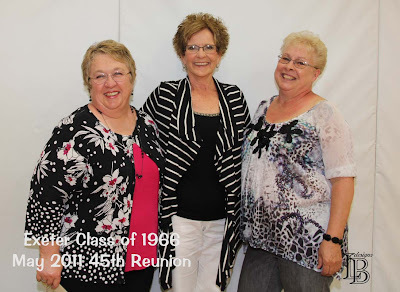 Each class was recognized during the evening event, sharing stories and introducing class members. 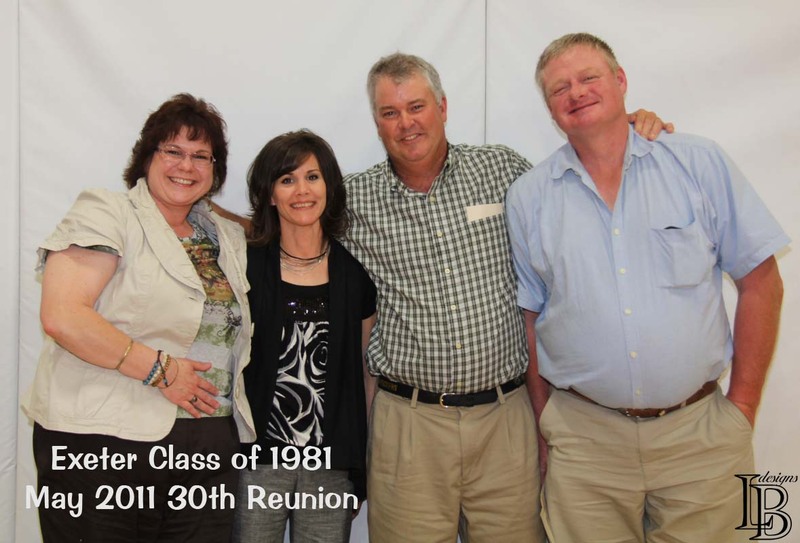 After a welcome from 2001 class member Allison (Michl) Bitz and a blessing by Jena (Tauriella) Johnson, Seth Jensen, a member of the class of 1991, took on his duties as emcee. He recognized Kendall Gloystein who had driven the furthest, from San Antonio, TX. 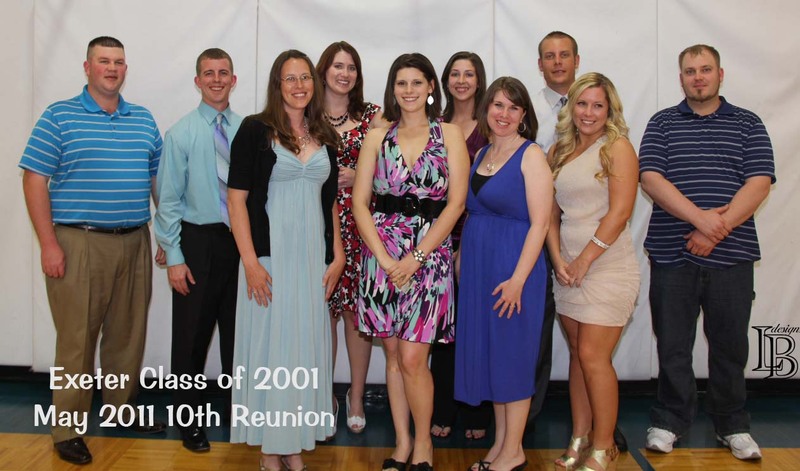 After the meal, Derek Betka, 2001, welcomed the class of 2011 who were well represented at the banquet. He gave out the awards from the alumni golf tournament. Kelsey Moore, spoke on behalf of the class of 2011, thanking the alumni association for their invitation. Jensen, with the assistance of Mitch Becker, introduced the honor classes. 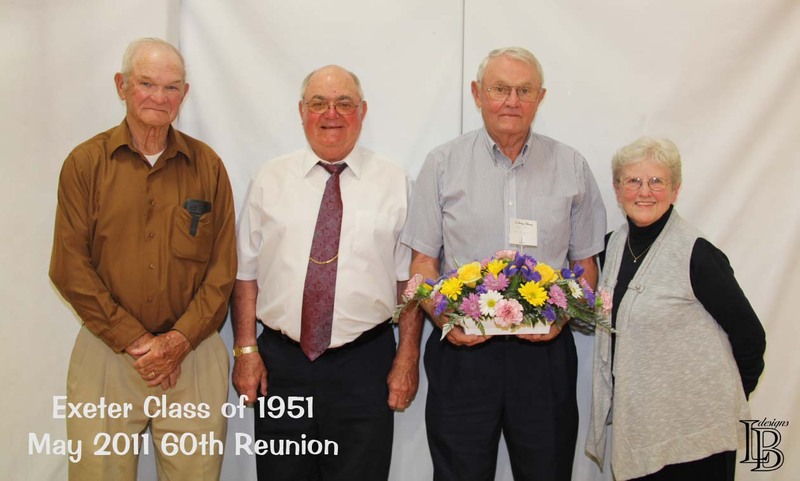 The oldest class represented was the class of 1941, with one member, Leo Soukup, attending. 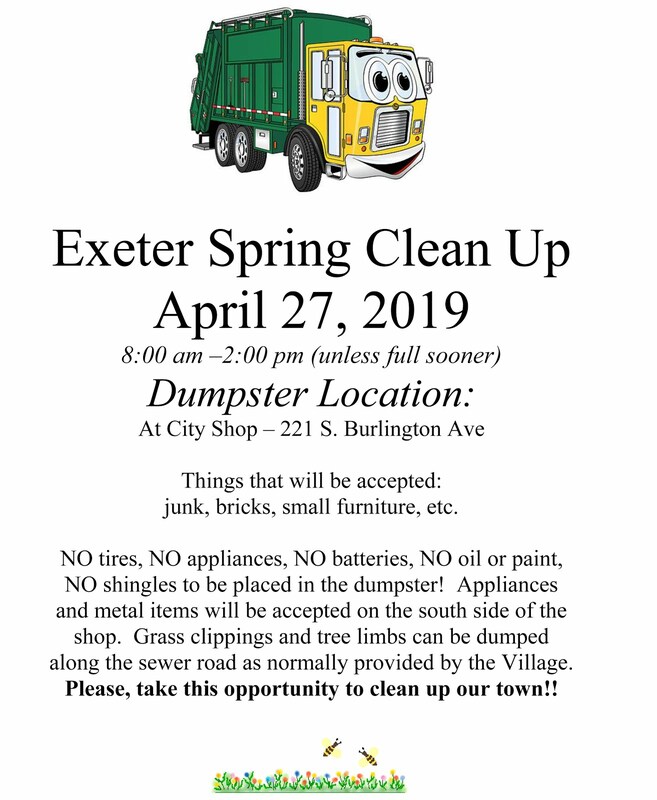 Soukup gave some poignant remarks talking about how much things have changed and remembering " my Dad gave $45 for a Model T so we could drive it to school, nowadays $45 won't fill up the tank of my car. 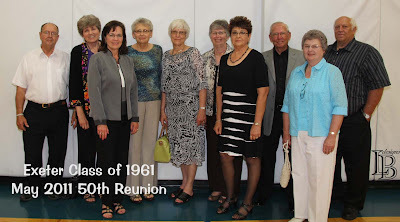 Hot lunches were served when I was a senior, before that we brought our dinner from home just like in country school." 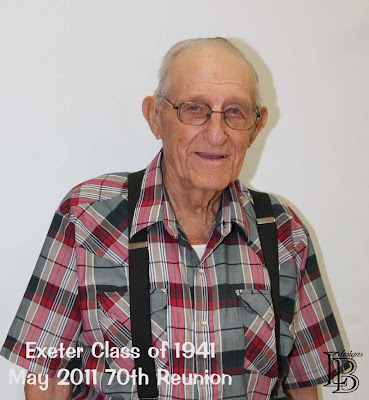 Most classes shared a personal story from their years at Exeter and the class of 2011 chose their favorite story which was from the class of 1961, told by Jack Underwood. They received the Eagle award. 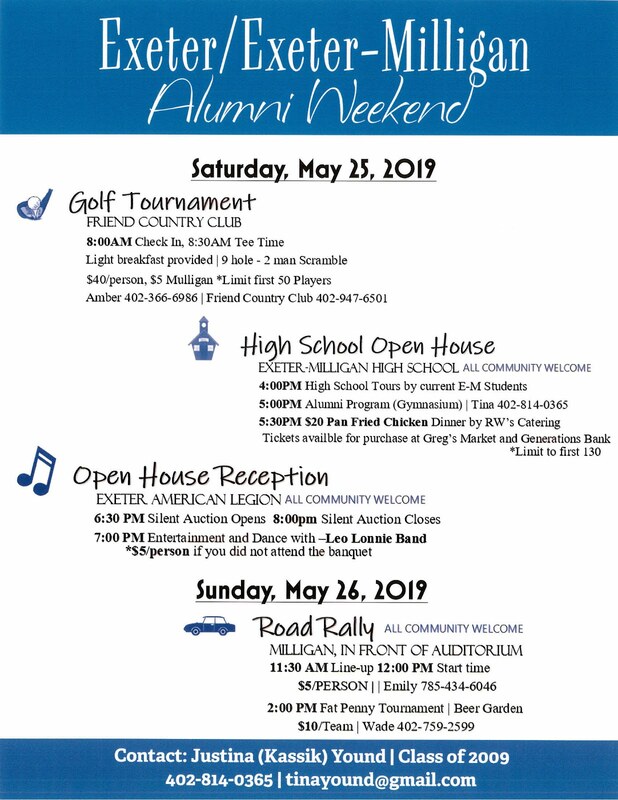 Becky (Harre) Erdkamp spoke on behalf of the Exeter-Milligan School Foundation before Bitz conducted a business meeting of the association and Robyn Manning closed the program invitng all attending to the Legion Home for the alumni dance immediately following the banquet. The Exeter Class of 1981 was represented at the banquet by these pictured from the left, Rena (Lee) Smith, Lori (Dumpert) Ruhl, Joe Dinneen, and Wade Hall. 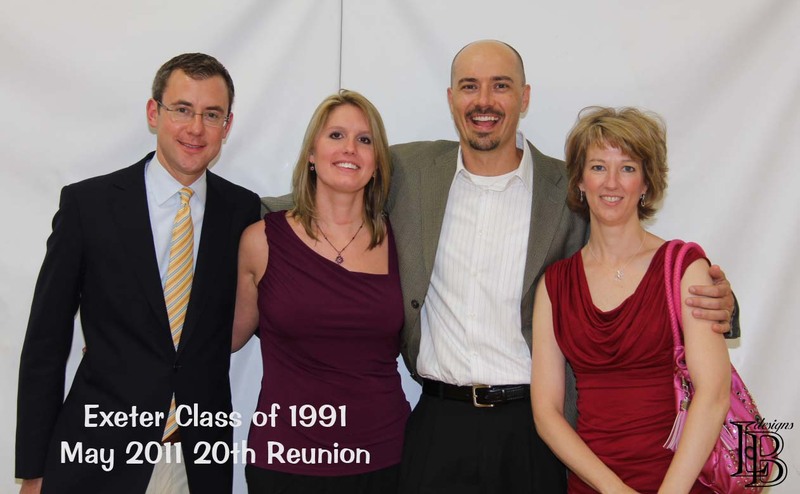 The Exeter Class of 2001 hosted the Exeter Alumni Banquet and pause for a picture between their duties. Back row from the left are Derek Betka, Mitch Becker, Erin Dinneen, Liz (Harre) Martin, Jackson Krecji, Jon Hall. Front row from the left are Cantrell (Stokebrand) Harrison, Allison (Michl) Bitz, Jena (Tauriella) Johnson, and Robyn Manning. The Exeter Class of 1961 was well represented at the Alumni Banquet. They are pictured from left to right, Sonny Hanson, Jackie (Erdkamp) Lindsay, Carolyn (Bender) Schuh, Rose (Luksik) Filipi, Arlene (Nolar) Anderson, Sheila (Elznic) Crays, Glady (Pribyl) Weber, Jack Underwood, Sandra (Hall) Horne, Larry Ekeler. The Exeter Class of 1991 was represented by these pictured from the left Jeff Zeleny, Heather Due-Eberspacher, Seth Green and Lynne (Heffelfinger) Filipi. 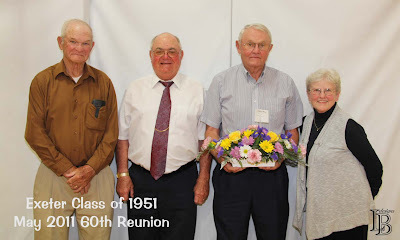 The Exeter Class of 1951 was represented by these pictured from the left, Boyd Gentry, Sterling Dyer, Dale Due and Alice (Wilson) Plettner. The flowers were in memory of classmate Bill Morgan. 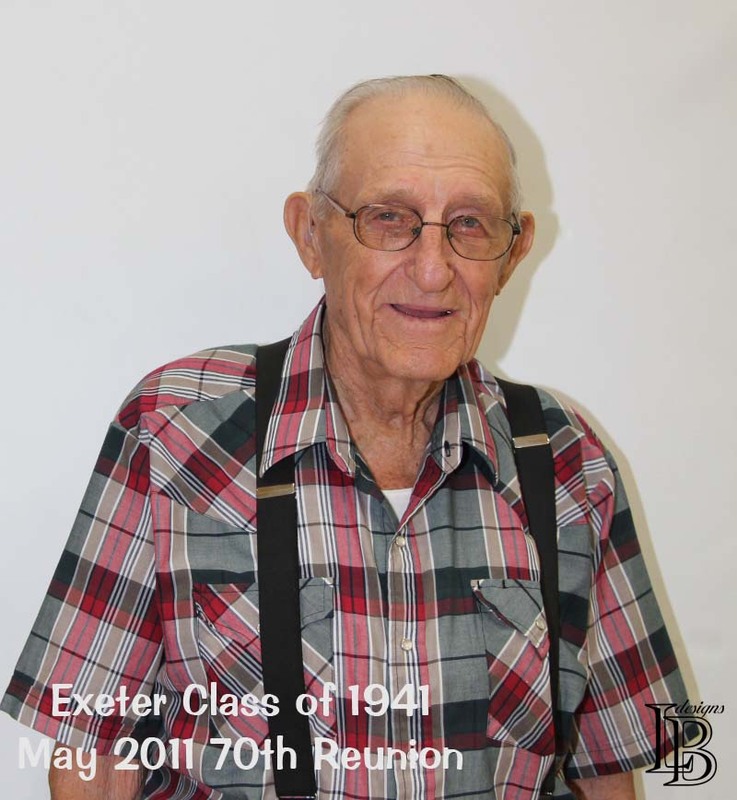 The only member of the Exeter Class of 1941 who was able to attend the Exeter Alumni Banquet was Leo Soukup. 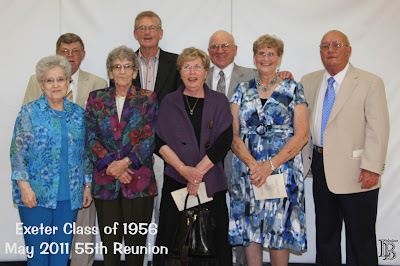 The Exeter Class of 1956 are pictured at the Alumni Banquet back row from the left are Warren Thomsen, Don Nelson, Tom Dumpert, and Garve Chapman, The frontrow from the left are Delores (Couch) Hamilton, Carla (Gentry) Kaufman, Dalyce Due, Colleen (Jansen) Davis. The Exeter Class of 1966 was represented at the banquet by three individuals pictured from the left, Cynthia (Stych) Harre, Jean Underwood and Joyce (Jurgensen) Votipka.